Off the Shelf! (Geekadrome: Games & Comics) – INDIE VOLT! Paul from Geekadrome Comics in Pittsburgh, PA.
Creator/Publishers looking to get their comic titles on the comic specialty shop shelves have long sought the answers to how best to do it, and why o’ why some store owners refuse to carry Indie titles. So we decided to barge into some LCS across the nation, corner the owners and get the story on what it takes to get your comics on the shelf! Joining us is Paul from Geekadrome : Games and Comics in Pittsburgh, Pa. Thanks for speaking with us Paul, as you know we’re starting a series where we speak to comic shop owners about carrying Independent comics, some stores do, some don’t and we’re learning now that the stores that carry Indie titles, find themselves sitting with comics that don’t sale. Is that something you’ve faced? Yes, but to be fair that happens with major labels as well. It’s just Indie comics especially less evergreen books are more subject to a sharp drop in relevance with the customers. But that can also be turned around by newer work, when a book comes out that gets hot it also improves sales for older works by the same writer/artist. Will a comic store, or at least your store purchase a Independent title direct from a publisher as opposed to going through Diamond? Some places will, some won’t risk the investment/space/in-store sales-push on Indie books. I’ve been approached to carry some indie books straight from the publisher and some self-published books and done both. What’s the biggest risk with carrying Indie comics in a comic book store? That’s tough to say, I can’t pick just one. I mean there’s the obvious Money, Space, and Time investment that a store takes on when carrying an indie book but there is also the fact that they are making an investment in the people who make that book. I’ve heard some horror stories from others about picking up an indie title and then getting complaints about the content or finding out the writer/artist had some scandalous past. That’s very relevant nowadays as we are hearing about actors and other producers facing scandals and having it affect not just their carriers but also the carriers of those that worked with them. This is something I’d advise any indie comic promoter, If your books have a good pedigree, push it. In your opinion, what’s holding indie comics back from having a more dominant hold on the market? Indie Comics have an unfair reputation for being cheaply printed, poorly written and crudely drawn, now a visit through pretty much any artist alley will dispel that myth, but it’s still pervasive, why do you think that idea or indie comics is still so widely accepted? Well, I wouldn’t say it’s underserved, while when I walk the artist alleys at conventions I do on average see a lot better art and better printed than I have pitched to me in the store. I think this is more of a case of “it’s always the worst that sticks out the most” and why I always encourage anyone who wants to produce their own content to run it past as many people as possible to check it before publishing it. All it takes is one-panel missing word balloons to take something that could launch a career to dusty long boxes. Before a creator calls or walks into a comic store to inquire about being carried there, what advice would you give them? What do they need to understand? Good question again and I think this is an overlooked opportunity for some, but here it is “Do your homework”. On your book, know your target audience. On the store, Look up their Social Media and it never hurts to complement the store or leave a good review and know when it’s a good time to talk. Sometimes I get up to a dozen of these calls or emails a week and It really shows to me who’s done this and who’d just sent a form letter. And you know what, the ones that do their homework, show that they care, those are the ones that get pushed by the sales staff. So for those publishers with no distribution plan whatsoever, what’s the best way to approach a store owner? I’d say, Ask the store owner if they have an account with a national shipping company, they may have an account you can use to ship to them and just offer them additional product or other promotional gifts for use of it (just to ship to them of course) If not, I’d look into contacting the USPS they offer very competitive shipping rates for media. Store’s gotta get paid, obviously. So creators need to be aware that the store isn’t going to buy a $5.00 comic at cover price if you were to purchase 10 comics with a cover price of $5.00 from a creator, how much should they expect to walk away with? That’s something that will vary on a case by case basis, depending on the product and other promotional concerns 50% is a good starting place on average, but that also depends on what the Store Manager considers the sale price should be for the book. I’ve had someone bring me in a stack of books he self-published, good quality, but after the ads, he had in it it had to have been under 15 pages and I had a hard time rationalizing a customer paying more than the major books for fewer pages and wading through all those ads. Which is more ideal, buying the comics outright like that from a creator or something closer to consignment, where they would leave the comics then come back in a month or so for their split of the sale? Consignment works on a smaller scale but if a store is buying your books they have faith in the product and will talk it up more to the customer base as they’ll be more invested in the well being. That being said I definitely have respect for the gorilla marketing tactic of just leaving one of your books on an open display in the shop with a business card inside. At some point either a worker or customer will notice the book. Indie Volt founder Varian Grant has been building a distribution company called Liberty Entertainment Distribution Group, www.LEDG.us that he hopes to offer retailers a 75% buy-back rate on indie titles they can’t sell that were purchased through them, is that something that as a store owner interest you? 😀 Smooth transition there, I think that is a very good starting place and I’d want to see more for it. Like doing business with any new business promotions and marketing are always a concern as well. Thanks Paul for opening our eyes! Hey if you want to disagree or complain on the internet feel free to do so in the comments below! Following today’s store the Geekadrome online will keep you informed on the latest and greatest and help you build that store roladex that EVERY publisher needs. You can find the Geekadrome on Twitter HERE and of course, you’re gonna want to like their FACEBOOK! 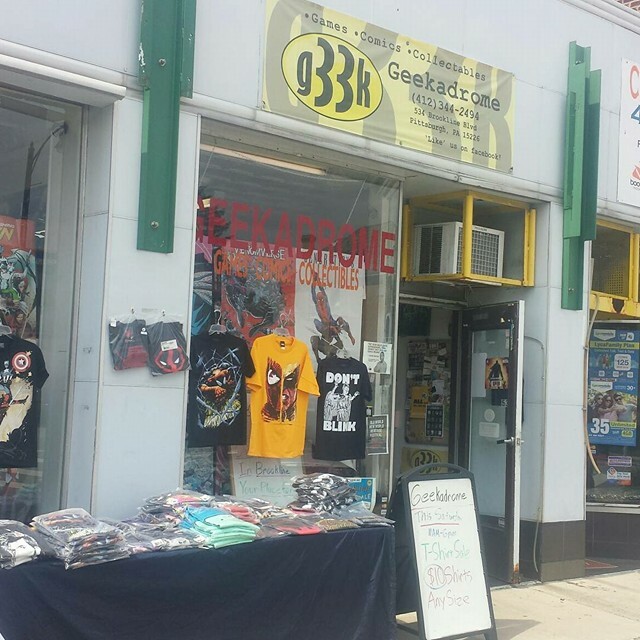 If you live in or find yourselves traveling to/through the PA, area, check out the Geekadrome, you can find it at 534 Brookline Blvd, Pittsburgh, PA 15226. And if you tell Paul you found out about the store here on Indie Volt, he’ll congratulate you for reading! Triple X Marks the Spot!